OHRID (NORTH MACEDONIA) - I hear midnight revellers from a far shore across Lake Ohrid, popularly pictured as a freshwater "sea" in North Macedonia because it is vast and deep. The lake is a natural amphitheatre that magnifies sound so that the distant merrymakers and live music seem strangely within earshot, which all adds to the magic of stepping into a new city. After a late dinner of grilled local trout, my travel companions and I are strolling on the lakefront promenade alongside Macedonians who include solitary women savouring this serene and spiritual corner of the country in summer. A lit cross is suspended on a hill above the city of Ohrid. At one time, this was the Jerusalem of the Balkans with 365 churches, one for each day of the year. Ohrid was also called the City of Light, two millennia before Paris gained this luminous sobriquet around the 18th century. The sweetness and light at the lake masks the unquiet history of the Balkans. North Macedonia was part of the former Yugoslavia that fragmented into six republics in the early Nineties as ethnic groups clashed for control. The country declared independence in 1991. Civilisations, too, have clashed in the Balkans, including the Greek, Roman and Ottoman empires. These prickly vestiges of empires intrude into the present. In February, the country, formerly known as Macedonia, was rechristened North Macedonia to sidestep a sovereignty squabble with Greece. Greece has a province named Macedonia, the home of its revered Alexander the Great, and contends that its neighbour is a wannabe - worse, an identity thief - that appropriates Greek cultural symbols. For instance, the conqueror's statue stands in North Macedonian capital Skopje, though another was removed from its airport last year. The name change has mollified Athens, which had been thwarting the republic's attempts to qualify for Nato and European Union membership, a path to prosperity. That road is now open. The whole naming campaign is a new reminder that North Macedonia is a small, syncretic country of many layers and epochs, as I discover on my four-day journey. I see this in the monument mania in Skopje portraying the country in a gorgeous light and in the lush canyons a mere 30 minutes outside the capital. It is seen in the joy of Slow Food inherent in the cuisine and in a small mosque built by Muslim sisters in a largely Christian Orthodox country. And so North Macedonia's facets are revealed in its cities and nature, food and spiritual narratives. Still, tranquil Ohrid seems uncomplicated at first glance. By day, there is a sensation of endless summer when we cruise on its translucent lake, half the size of Singapore, for splendid views of the ancient red-roofed city cocooned by layers of hills. The city and lake are inscribed on the Unesco list as a natural and cultural heritage site. I love the glimpses of private coves perfect for picnics and the graceful curves of hills. Earlier, atop one of these hills, we had walked on the wind-swept stone ramparts of the Samuil Fortress. It is our step into the Byzantine past, when Ohrid was the glorious capital of a Slavic empire in the 11th century, and not today's less-known Balkan destination relative to the Croatian city of Dubrovnik that is enshrined in popular culture by the Game Of Thrones television blockbuster. Ohrid may be less explored, but its local "pearls" have adorned Europe's rich and famous, including the late Princess Diana. The Filev and Talevi families have, since the 1920s, crafted jewellery by painting lustrous layers of a secret emulsion concocted from the scales of the plasica, a small, fast- swimming fish native to Lake Ohrid. The local pearl has a Russian connection, says Mr Mihajlo Filev, the fourth-generation owner of Ohrid Pearl (ohridpearl.com). In 1928, his great-grandfather, a restaurant owner, became friends with a mysterious Russian emigre named Jovan Subanovich. One day, the Russian spied fishermen carting plasica from Lake Ohrid. He realised this was similar to fishes netted from another vast, ancient body of water, Lake Baikal deep in Siberia. He taught his Balkan friend the secret of pearl-making. Lake Baikal, which I once visited on a Trans-Siberian rail journey, is even richer in endemic natural life. There, the world's only freshwater seals cavort in the lake, looking like whimsical, spherical missiles. They feast on bizarrely pink, scaleless golomyanka or "oil-fish". These lakes in Russia and North Macedonia show that the planet will never run out of wonders. 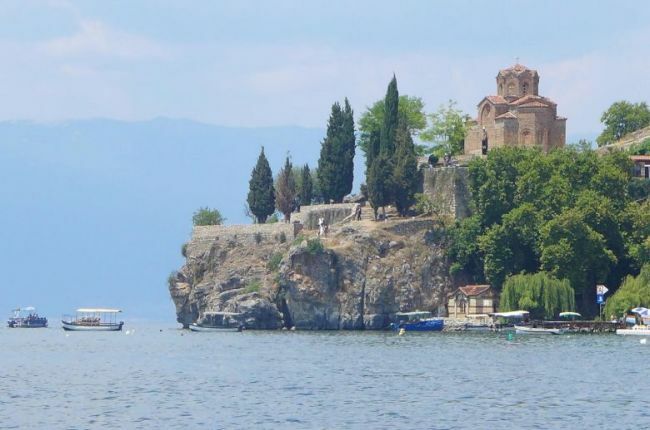 And so Ohrid feels pure and less-explored, like much of the country's nature and cuisine. On our journey across the western half of the republic, we roll past conifer-covered mountains, canyons, rivers and lakes. These wild places, and also small farms, yield some of Europe's most flavourful ingredients. North Macedonia enjoys 280 sunny days a year, so its produce thrives in the fine weather conditions. Even the simplest salad of chopped tomato, cucumber and onions is divine and I enjoy a variation every day. As a tomato-lover, I would love to savour again the plump, juicy, native jabolchar. The mountainous, landlocked country is naturally all about Slow Food - which relies on the best, seasonal local ingredients and homespun cooking - even without trying to shoehorn itself into this global movement. Among the standouts on my journey is the rustic-chic Hotel Tutto Restaurant (tutto.com.mk) in the small mountain village of Jance. We sit at the end of a long, quiet terrace for a late lunch. Bountiful platters arrive - beans with a smoky flavour, grilled sweet pale-green peppers in regular and spicy versions, tender beef stew, creamy polenta and other dishes that display tradition with finesse. Like the tomato salad that is sweet simplicity, the basic bread here and elsewhere is a treat - a pleasing circle of layered, fluffy bread flecked with feta. Another feast to remember is the Ohrid trout in Restaurant Sveta Sofija (Tsar Samoil 88, Ohrid 6000). The fish is a protected species, but enough fingerlings are released into Lake Ohrid to be served to tourists. The grilled trout is deboned at our table. It is an unadorned dish, so the purity of the flavour shines through. The secret lies in slow cooking and simple touches. Like the food - which mixes Mediterranean flavours and Middle Eastern influences - the country is a richly layered experience. Amid the many monasteries are some mosques, such as the Sarena Dzamija, which is also called the Painted Mosque, in Tetovo city. Instead of great men, the mosque was financed by two sisters named Hurshida and Mensure in 1459. It is known for its vibrant floral and geometric paintings that used 30,000 egg yolks mixed with pigments. The art was commissioned in a later century by landowner Abdurrahman Pasha, who hired Christian artisans with experience in fresco techniques. It is contemplative to sit in an alcove for women on an upper level, and imagine the co-existence of Christians and Muslims. After the languor of Lake Ohrid, it can be a jolt to the senses to walk in Skopje. It is awash with new statues and monuments that look like a pastiche. Imagine a child randomly throwing toys, as a local gripes to me. A controversial facelift, Skopje 2014, was ordered by the government to diffuse Soviet bleakness and entice tourists. Estimated to cost €500 million (S$767.5 million) or more, the project saw monuments and buildings in a faux classical style planted in the city. I step onto the Bridge of Art under statues of poets, musicians and artists, as music plays from speakers on the pedestrian bridge. Other archaic monuments also adorn not-so-ancient spots. While there is a disconnect, I remember that small, poor countries have big ambitions and Singapore was among them. In the city square, the colossal statue of Alexander the Great is surrounded by bronze lions, and also the signs for global behemoths Huawei and Coca-Cola. While this statue projects bombast rather than gravitas, there is a sweetness watching Macedonians walking jauntily around it on a Friday. At night, squealing children pelt through water spray from the colour-changing fountain. Not all is painfully new or kitschy in Skopje. The small Mother Teresa Memorial House (Macedonia St bb, Skopje 1000) is not open, but I admire its facade - retro-futuristic yet unassuming like the Albanian nun and Nobel Prize-winning humanitarian. Skopje is her home town; Albania lies on the western border of North Macedonia. The past is alive in Carsija, or the Old Bazaar, where I wander among hamman or Turkish baths and caravanserai or roadside inns that lined ancient trade routes - signs of 500 years of Ottoman rule in the Balkans. I cross the Stone Bridge at different hours. A symbol of the city, the bridge, with its 12 semi-circular arcs, rises dreamily over the Vardar River. It connects old and new Skopje. I walk across it once for a glamorous Qatar Airways party at a hotel, where a performer plays classical tunes on an electric cello on a stage bathed in theatrical hues. Like Skopje itself, that evening fuses tiers of time. And so North Macedonia is a small country with many faces. It merges empires and quests, and those vanished days pervade the country today, like the sound of unseen merrymakers across the lake.